An increasingly aging population will add to the number of individuals suffering from amyloid. Protein Misfolding Diseases provides a systematic overview of the current and emerging therapies for these types of protein misfolding diseases, including Alzheimer's, Parkinson's, and Mad Cow. 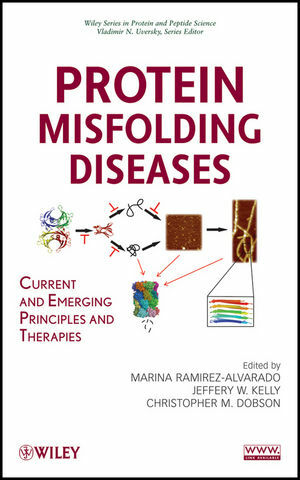 The book emphasizes therapeutics in an amyloid disease context to help students, faculty, scientific researchers, and doctors working with protein misfolding diseases bridge the gap between basic science and pharmaceutical applications to protein misfolding disease. MARINA RAMIREZ-ALVARADO is an Assistant professor of Biochemistry and Molecular Biology at the Mayo Clinic. Despite being a young investigator, she is already a world leader in the study of molecular determinants of light chain amyloidosis, a reare misfolding disease. JEFFERY W. KELLY is a Professor of Chemistry and Molecular and Experimental Medicine at the Scripps Research Institute. He is one of the leading authorities in the field of protein misfolding, with over 250 publications to his credit. CHRISTOPHER M. DOBSON is a Professor in the Department of Chemistry at the University of Cambridge. Dr. Dobson is a leading researcher studying the structure and biochemical bases of protein misfolding diseases and has over 500 publications. INTRODUCTION TO THE WILEY SERIES ON PROTEIN AND PEPTIDE SCIENCE (Vladimir N. Uversky). PART I PRINCIPLES OF PROTEIN MISFOLDING. 1 Why Proteins Misfold (Silvia Campioni, Elodie Monsellier, and Fabrizio Chiti). 2 Endoplasmic Reticulum Stress and Oxidative Stress: Mechanisms and Link to Disease (Jyoti D. Malhotra and Randal J. Kaufman). 3 Role of Molecular Chaperones in Protein Folding (Kausik Chakraborty, Florian Georgescauld, Manajit Hayer-Hartl, and F. Ulrich Hartl). 4 Kinetic Models for Protein Misfolding and Association (Evan T. Powers and Frank A. Ferrone). 5 Toxicity in Amyloid Diseases (Massimo Stefani). 6 Autophagy: An Alternative Degradation Mechanism for Misfolded Proteins (Maria Kon and Ana Maria Cuervo). 7 Role of Posttranslational Modifications in Amyloid Formation (Andisheh Abedini, Ruchi Gupta, Peter Marek, Fanling Meng, Daniel P. Raleigh, Humeyra Taskent, and Sylvia Tracz). 8 Unraveling Molecular Mechanisms and Structures of Self-Perpetuating Prions (Peter M. Tessier and Susan Lindquist). 9 Caenorhabditis elegans as a Model System to Study the Biology of Protein Aggregation and Toxicity (Elise A. Kikis, Anat Ben-Zvi, and Richard I. Morimoto). 10 Using Drosophila to Reveal Insight Into Protein Misfolding Diseases (Julide Bilen and Nancy M. Bonini). 11 Animal Models to Study the Biology of Amyloid-β Protein Misfolding in Alzheimer Disease (Karen H. Ashe). PART II PROTEIN MISFOLDING DISEASE: GAIN-OF-FUNCTION AND LOSS-OF-FUNCTION DISEASES. 12 Alzheimer Disease: Protein Misfolding, Model Systems, and Experimental Therapeutics (Donald L. Price, Alena V. Savonenko, Tong Li, Michael K. Lee, and Philip C. Wong). 13 Prion Disease Therapy: Trials and Tribulations (Valerie L. Sim and Byron Caughey). 14 Misfolding and Aggregation in Huntington Disease and Other Expanded Polyglutamine Repeat Diseases (Ronald Wetzel). 15 Systemic Amyloidoses (Marina Ramirez-Alvarado and Joel N. Buxbaum). 16 Hemodialysis-Related Amyloidosis (David P. Smith, Alison E. Ashcroft, and Sheena E. Radford). 17 Copper?Zinc Superoxide Dismutase, Its Copper Chaperone, and Familial Amyotrophic Lateral Sclerosis (Duane D. Winkler, Mercedes Prudencio, Celeste Karch, David R. Borchelt, and P. John Hart). 18 Alpha-1-Antitrypsin Deficiency (David A. Lomas and David H. Perlmutter). 19 Folding Biology of Cystic Fibrosis: A Consortium-Based Approach to Disease (William E. Balch, Ineke Braakman, Jeff Brodsky, Raymond Frizzell, William Guggino, Gergely L. Lukacs, Christopher Penland, Harvey Pollard, William Skach, Eric Sorscher, and Philip Thomas). 20 Thiopurine S-Methyltransferase Pharmacogenomics: Protein Misfolding, Aggregation, and Degradation (Fang Li and Richard M. Weinshilboum). 21 Gaucher Disease (Tim Edmunds). 22 Cataract as a Protein-Aggregation Disease (Yongting Wang and Jonathan A. King). 23 Islet Amyloid Polypeptide (Andisheh Abedini and Daniel P. Raleigh). PART III ROLE OF ACCESSORY MOLECULES AND RISK FACTORS. 24 Role of Metals in Alzheimer Disease (Blaine R. Roberts and Ashley I. Bush). 25 Why Study the Role of Heparan Sulfate in In Vivo Amyloidogenesis? (Robert Kisilevsky and John Ancsin). 26 Serum Amyloid P Component (Simon Kolstoe and Steve Wood). 27 Role of Oxidatively Stressed Lipids in Amyloid Formation and Toxicity (Paul H. Axelsen and Hiroaki Komatsu). 28 Role of Oxidative Stress in Protein Misfolding and/or Amyloid Formation (Johanna C. Scheinost, Daniel P. Witter, Grant E. Boldt, and Paul Wentworth, Jr.). 29 Aging and Aggregation-Mediated Proteotoxicity (Ehud Cohen and Andrew Dillin). PART IV MEDICAL ASPECTS OF DISEASE: DIAGNOSIS AND CURRENT THERAPIES. 30 Imaging of Misfolded Proteins (Harry LeVine, III). 31 Diagnosis of Systemic Amyloid Diseases (Morie A. Gertz). 32 Identification of Biomarkers for Diagnosis of Amyloid Diseases: Quantitative Free Light-Chain Assays (Jerry A. Katzmann). 33 Real-Time Observation of Amyloid-b Fibril Growth by Total Internal Reflection Fluorescence Microscopy (Tadato Ban and Yuji Goto). 34 Current and Future Therapies for Alzheimer Disease (Paramita Chakrabarty, Pritam Das, and Todd E. Golde). 35 Current Therapies for Light-Chain Amyloidosis (Angela Dispenzieri and Shaji Kumar). 36 Familial and Senile Amyloidosis Caused by Transthyretin (Steven R. Zeldenrust and Merrill D. Benson). 37 Identifying Targets in a-Synuclein Metabolism to Treat Parkinson Disease and Related Disorders (Julianna Tomlinson, Valerie Cullen, and Michael G. Schlossmacher). 38 Emerging Molecular Targets in the Therapy of Dialysis-Related Amyloidosis (Gennaro Esposito and Vittorio Bellotti). 39 Familial Amyloidosis Caused by Lysozyme (Mireille Dumoulin). 40 Therapeutic Prospects for Polyglutamine Disease (Maria Pennuto and Kenneth H. Fischbeck). PART V APPROACHES FOR NEW AND EMERGING THERAPIES. 41 Chemistry and Biology of Amyloid Inhibition (Mark A. Findeis). 42 Immunotherapy in Secondary and Light-Chain Amyloidosis (Jonathan Wall). 43 Anti-Misfolding and Anti-Fibrillization Therapies for Protein Misfolding Disorders (Zane Martin and Claudio Soto). 44 Therapies Aimed at Controlling Gene Expression, Including Up-Regulating a Chaperone or Down-Regulating an Amyloidogenic Protein (Gregor P. Lotz and Paul J. Muchowski). 45 Understanding and Ameliorating the TTR Amyloidoses (Steven M. Johnson, R. Luke Wiseman, Natalia Reixach, Johan F. Paulsson, Sungwook Choi, Evan T. Powers, Joel N. Buxbaum, and Jeffery W. Kelly). Protein Misfolding This site contains color images from Protein Misfolding Diseases.